Of major importance in the history and development of Orthodoxy was the conversion of the Slavs and the shifting of the focus of the Church to the northern regions of Bulgaria, Serbia, Moravia, Romania, and then Russia. 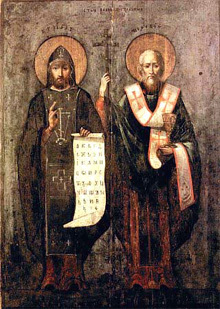 In the middle of the 9th Century, Patriarch Photius initiated large scale missionary labors in these regions by sending out the two brothers Constantine (in monasticism Cyril - 869) and Methodius (885 - both are commemorated May 11), first to the Khazar State north of the Caucasus (this was largely unsuccessful) and then to Moravia (Czechoslovakia) in 863. The Prince of Moravia, Rostislav, desired that his people hear the Word of God in their own language and the two brothers were apt missionaries in this respect as they had developed an alphabet, adapted from the Greek, which later was called Cyrillic (after St. Cyril). Using a local Macedonian dialect which they had heard near their birthplace of Thessalonica, the brothers began translating the liturgical books, Holy Scripture, etc., into this dialect, using the new alphabet which they had developed. This new liturgical language - Church Slavonic - became of crucial importance in the extension of the Orthodox faith into the Balkans and ultimately to Russia. This was so, since, unlike the Roman Catholic Church, which continued to insist on the use of Latin, the use of Church Slavonic allowed the new converts to hear the Gospel and the services in a language they could understand. The Mission to Moravia was ultimately doomed to failure because of the jealousy and persecution of German missionaries working in the same area. The brothers traveled to Rome (where St. Cyril died) and placed themselves under the protection of the Pope, but this was not honored by the Germans in Moravia and after the death of St. Methodius in 885, his followers were expelled from the country. The missionary labors of Cyril and Methodius were not in vain, however, for their disciples were successful in Serbia, Romania and Bulgaria. Led by St. Clement of Ochrid (commemorated November 25), the missionaries were successful and in 869, Tsar Boris of Bulgaria himself was baptized. The Bulgarian Church grew rapidly and about 926, under Tsar Simeon, an independent Patriarchate was established there, recognized by Constantinople in 927 (although later supressed), and the Bulgarian Church became the first national Slavic Church. The missionaries were likewise successful in Serbia and with the baptism of Prince Mutimir (891), Serbia became officially Christian. After a period of vacilation between East and West, Serbia came under the sway of Constantinople. Under St. Sava (l237 - commemorated January 12), the Serbian Church became partially independent with his consecration in 1219 as Archbishop of Serbia, and in 1346 a Serbian Patriarchate was established with the consecration of Bishop Ioannikios, recognized by Constantinople in 1375. Missionaries from Bulgaria traveled to the Romanian lands and by the end of the 9th Century portions of the Romanian people had been Christianized, adopting the Slavonic Liturgy, but it was not really until the rise of the Wallachian - Moldavian principalities in the 14th Century that the Church actually began to thrive. In 1359 a Wallachian Metropolitan was appointed by Constantinople to the new See of Arges in the foothills of the Transylvanian Alps and in 1401, the Romanian Metropolitan of Suceava in Moldavia was recognized by Constantinople.